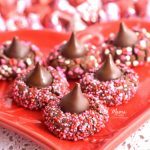 Gluten-Free Chocolate Kiss Cookies are a twist to the traditional blossom cookie. Where decadent chocolate cookies, rolled in sprinkles, collide with Hershey Kisses. A perfect treat for Valentines Day. My kids love it when I bake, especially something chocolate. This year for our annual Christmas cookie decorating party we made gluten-free Christmas Sugar Blossom Cookies. They had so much fun making them with their friends, especially rolling them in all of the different sprinkles. 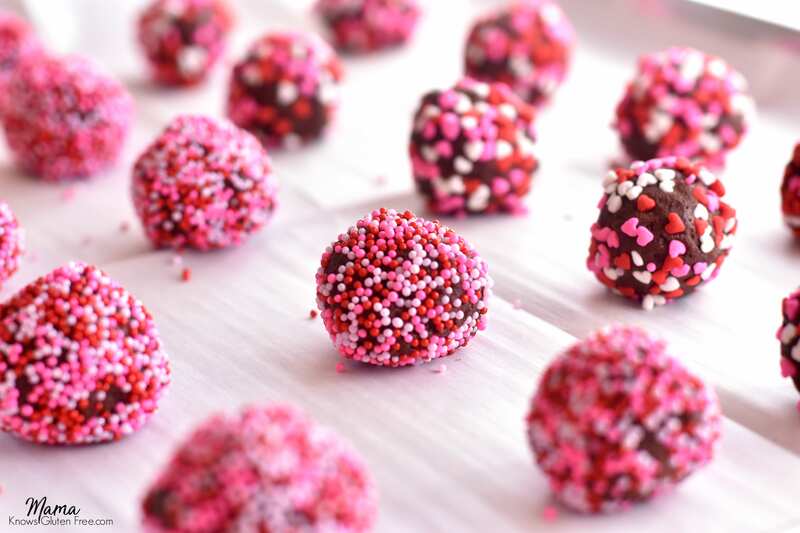 I thought what a better way to celebrate my love for my kids and Valentine’s Day but to make a chocolate version of one of their favorite cookies, sprinkles and all. This is the second year for the Valentine’s Day event for Cookies for Kid’s Cancer! I have teamed up with a group of my food blogger friends to share Valentine’s Day inspired recipes to help raise funds for pediatric cancer. We want to make a difference in the fight against pediatric cancer! One of my love languages is baking so I was really blessed that I could help raise awareness of pediatric cancer and help raise funds for Cookies for Kids’ Cancer by sharing a Valentine’s Day recipe with you. This recipe for Gluten-Free Chocolate Kiss Cookies is inspired by my children. My heart is my children and I could not think of a more worthy cause to help support than pediatric cancer treatment research and awareness. Thanks to many of you, we have already reached our goal of $3000, but you can still donate and help us make an even bigger difference! I hope you will join me and please help us make a difference in the life of a child battling cancer by donating to Cookies for Kids’ Cancer. You can make a donation HERE. Thank you! Below the recipe is a list of the amazing bloggers that are participating in this event for Cookies for Kids’ Cancer. There are even a few more gluten-free recipes, so keep an eye out for them. Just a note: I’m not receiving any money from sponsors or anyone for this event. All money raised is going to directly to Cookies for Kids’ Cancer, a nonprofit organization. CK4C is a 501(3)(c) charity and your donation is tax deductible. 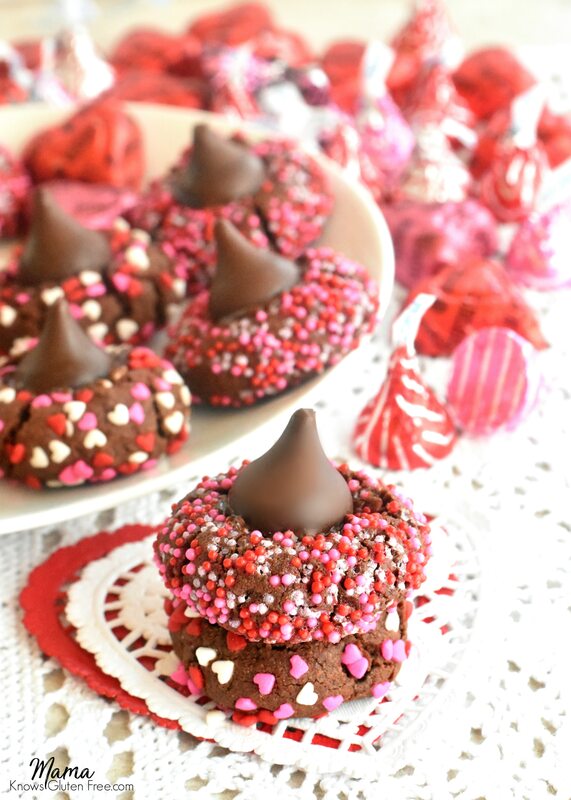 Gluten-Free Chocolate Kiss Cookies are a twist to the traditional blossom cookie. Where decadent chocolate cookies, rolled in sprinkles, collide with Hershey Kisses. In a medium bowl, whisk together the gluten-free flour, xanthan gum (leave out if your flour already has it), cocoa powder, and salt. In a large bowl cream the butter on medium-high speed until smooth, about 1 minute. Add the sugar and brown sugar and beat until creamed, about 2 minutes. Add the egg yolk, milk, and pure vanilla extract, and beat on high speed until fully combined, scraping down the sides of the bowl if needed. Pour the gluten-free sprinkles into a small bowl. 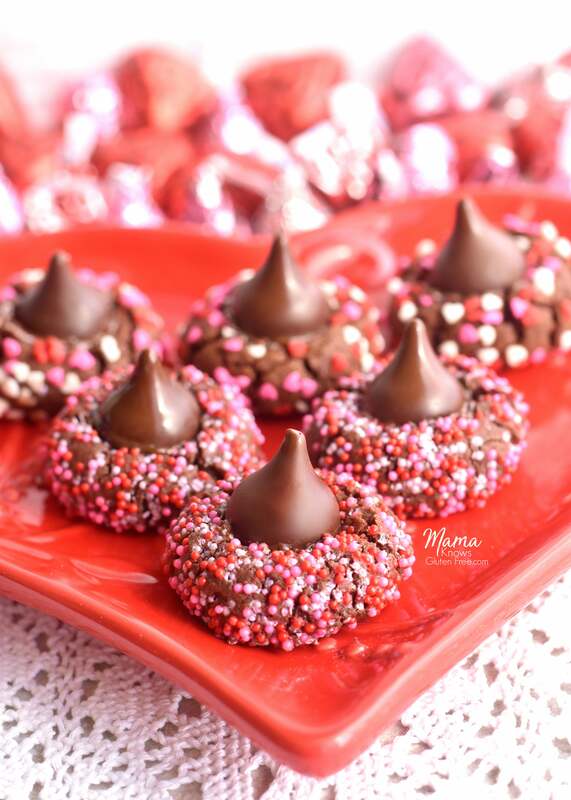 As soon as you bring the cookies out of the oven place the unwrapped Hersey Kisses in the center of each cookie. These cookies look so delicious and pretty too! And they’re gluten free….bonus! Happy to be part of this great fundraiser with you Audrey! Thank you Gwynn! I am very blessed to be part of this with you fundraiser too.